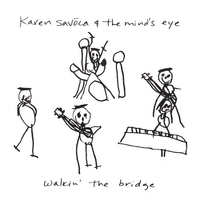 Karen Savoca's mom was the featured vocalist on a nightly TV show in Fresno, California. When her family moved east to northern New Jersey, she met a young builder, choosing marriage and motherhood over a singing career. It was no surprise that her little girl was always dancing and singing. At ten, Karen bought her first album on a whim... it was Life, by Sly and The Family Stone. For years Karen's folks drove every weekend from NJ to their camp in the mountains of upstate NY, toggling between country and city... early training for a life on the road. When Karen was thirteen they built a log home and settled there. Friends were astonished at her ability to learn the lyrics to any song in one listening. Although she wanted to play the drums, she got piano lessons instead. The piano was next to the TV, so she would jump up to play during commercials and half-times. She bought herself a guitar with the birthday money she'd saved, and when no one was around she started composing. Living on a mountain offered plenty of solitude for the little poet, and she wrote privately for many years, all the while performing at school, county fairs and coffeehouses. Never doubting that she would live a life of music, she attended Crouse College at Syracuse University, but Karen had always sung in her own voice, and the curriculum was operatic and restrictive... she switched her major to Elementary Ed where she developed passionate views about teaching young children. During that time she honed her singing style with several groups in clubs on and off campus. While he was visiting home from Atlanta, Karen met guitarist Pete Heitzman in a mystical encounter. He'd gone to a club to catch an old friend's band, and Karen was their new singer. They jammed all night... powerful chemistry evident right from the start. Pete joined the band the next day, and the two have been together ever since. Karen and Pete moved to New York City for four years... gigged, worked strange temp jobs, wrote songs, and saved enough to assemble a studio... and returned to the relative peace of Syracuse. By now the response to Karen's songs was so positive that they formed an all original, improvisation-laced band with the best jazz and funk players in the area. The Mind's Eye played every Monday for seven years at The Orange Grove, a bar just off the SU campus. With the band, Karen played a Hohner Clavinet, lots of hand percussion, and finally got herself a drum (that's a conga, not a bongo). Their audience danced and improvised as well, call and response style, sometimes developing elaborate counterpuntal routines. Known as Grovers, Karen and Pete encounter these SU grads wherever they go. Walkin' The Bridge appeared in 1988, and charmed T-Bone Wolk into co-producing On The River Road in 1993. The song, "Language Of Love" was chosen out of 3,500 entries to win the Grand Prize in MUSICIAN Magazine's Best Unsigned Band Contest in 1995. The duo split off and developed their unique spare approach, retaining the dynamic of the dance band. By now Karen's vision was in full bloom, and after many years of pleading, Pete finally convinced her that they should perform under her name. In 1997 they signed with Fleming/Tamulevich &; Associates booking agency and began their travels. 1998's Sunday In Nandua was another collaboration by Karen, Pete and T-Bone, and has been added to many radio playlists across the country and abroad. Karen's music confounds even the most staunch pigeonholers. It's bravely non-traditional, yet completely accessible. Her appearance on the contemporary folk scene says more about the extremely broad-minded audience of folk than it does about her music. The duo's live performances are uplifting and hypnotic, more funk than folk. At the Vancouver Folk Festival '99, as the Sunday sun was setting, for the first time in 22 years, 10 thousand people inexplicably removed their shoes and waved them over their heads. Playing conga and hand percussion, Karen infuses the music with her love of Soul, R&B, and World rhythms. Together she and innovative guitarist Pete Heitzman have been described as a self-contained mini-band with "the fearlessness of a high-wire act working without a net." It's an elusive mix... melodic, funky and spontaneous. They live and record in an old renovated church in rural upstate New York. Their latest indie release, Here We Go, was co-produced by Karen and Pete, and features long-time collaborator, multi-instrumentalist Tom "T-Bone" Wolk (Elvis Costello, Shawn Colvin, Sat. Night Live Band, Eileen Ivers...). 150 shows in 1998 introduced them to new audiences all across the country. This included five tours with national treasure and Grammy nominee Greg Brown, and an appearance with Greg on A Prairie Home Companion in '99. I loved this band so much in my SU days that I scheduled tuesdays off in my senior year because they played on Mondays. This is great that I can turn my kids on to the "motion music" from when I was dating the woman who became my wife. Karen and Pete we all hope you are well and enjoing life. This and all of the CD's afre great. I was worried that since this is an earlier work, it would be less refined than some of their later music. This is not the case. Though there is a raw quality to these songs, it helps to give them a down home flavor. To me, it starts off feeling like a walk downtown with my girl, seeing the sights in the evening. It finishes up feeling like home, in front of the fire with a warm blanket on a cold night. Somewhere in the middle, it takes me to a place i didn't know i wanted to be, and i'm glad to be there. This album has energy without being in your face, it's like a soft glow and a kind grin. I was so happy to find their music online. I was one of the fortunate ones to see them perform at the Orange Grove every Monday night during my SU days...I play it in my car constantly. My 8 year old loves "Savannah" and my 5 year old loves "The One I Dream". This CD is sure to be one of my long-time favorites.